Overview - A former Russian mobster named Ruslan, returns home and discovers his daughter is marrying his arch nemesis. His past also comes back to haunt him when his family is threatened. Hungry for justice, Ruslan returns to the life he once knew...with a vengeance. This time, Seagal gives a half-baked performance as Ruslan Drachev, a former Russian mobster turned crime novelist who has returned home for the wedding of his daughter, Lanie (Laura Mennell). At the household of his ex-wife Catherine (Inna Korobkina), the occasion quickly turns sour when Ruslan learns the groom is Stephan (Dimitry Chepovetsky) -- the son of notorious gangster Mikhail (Igor Jijikine). Ruslan doesn't like what he hears and while he's cooling off at a tavern, Catherine and Lanie are brutally assaulted by thugs. With his ex dead and Lanie in critical condition, Ruslan sets out for vengeance. However, when Stephan joins him on his quest, he realizes he may have been quick to judge his future son-in-law. I'm aware these kinds of movies aren't known for their exceptional acting to begin with, but man, 'Driven to Kill' has to have some of the worst performances I have ever witnessed in any movie. Once again, Seagal lazily mutters through his scenes as if he just came out of hibernation following a long cold winter. Whether he's weary, bored, or suffers from narcolepsy, somebody really needs to get this guy an espresso before his day begins. What's more, even the support characters like Detective Norden (Ingrid Torrence) and especially Dr. Brown (Linda Minard) induce wince after wince whenever they open their mouths to speak. I can't even begin to explain how awful they are in this film -- so you'll just have to take my word for it. I did learn a few things from watching 'Driven to Kill,' though. I learned that detectives leave their badges lying around in crime scenes so anyone could pick them up and impersonate the police, and not even get arrested for it when they're caught red-handed. I also learned that pawn shops keep their security equipment right next to the cashier so when they are robbed, the surveillance tape is at arm's reach for the criminal's taking. Plus, if I have a relative in the hospital that I need to check on, I now know to simply call the doctor's cell phone, which is always turned on in their pocket despite the facility's regulations. Oh wait -- these aren't the facts of life, they're just ridiculous parts of this story that were obviously added for convenience purposes and nothing more. Finally, I can't end this review without delving into Jeff King's utterly sloppy direction. I was going to cut him a break if he was a rookie, but after checking out his resume on IMDb.com he's been doing this for a while, so why is this film so amateurish? Every action scene overuses the "shaky cam" technique making it very difficult to tell what is happening on screen, and some scenes lop off the top of actors' heads or have them slipping off the sides, too. The best part is how he draws his inspiration from --of all things -- classic comedies. Don't believe me? Watch for the patented 'Wayne's World' extreme close-up on Seagal's furious eyes at around the 21 minute mark. And remember that scene in 'Monty Python and the Holy Grail' when Lancelot is storming across the field toward the castle in a continuous loop? Well, ha-HA! Seagal has a sequence exactly like that montage when he's walking down the street. I'm not even joking, either, and that's the sad part. If I hadn't seen the Blu-ray case with my own two eyes, I never would have guessed 'Driven to Kill' is actually a high-definition product. The 1080p/AVC MPEG-4 (1.85:1 aspect ratio) encode is easily one of the ugliest transfers I've seen to date. Contrast here is all over the place. Depending on the scene, grass is often yellow and beaches have an orangey tinge to them. Fleshtones are just as inconsistent, as the female detective and Drachev's ex have pasty bleach-white skin, while Seagal sometimes has an olive coloring, but other times it looks like he may have fallen asleep for a few hours in a tanning bed. The picture is also quite grainy, and the fuzziness gets worse in closed-in places such as the interrogation room. The flat image offers very little depth, and detail suffers as well. Each of the dancers' faces in the background at the restaurant is more of a smeared blur, for example. I caught hot pixels every once in awhile, and there are instances of banding, too. The black levels remain pretty solid from start to finish, though, but that's about the only positive thing I can say about this pathetic release from Fox. Being a Fox disc, the U.S. version of the 'Driven to Kill' Blu-ray is region-locked and therefore will only play on Region A PlayStation 3 and standalone players. This is one case where if you live in Region B or C you can consider yourself lucky. The Blu-ray packaging for 'Driven to Kill' lists optional English SDH and Spanish subtitles as well as a lossless English DTS-HD 5.1 audio track. But again -- just like the video -- you could've fooled me. The dialogue is irritatingly quiet, not to mention flat and tinny. It didn't help matters that half the time Seagal mumbles his way through his lines, either, rendering them practically incomprehensible. When the action kicks in, it's kept tightly to the front channels with hardly any rear activity at all. Gunfire is a lot flimsier than most other recent releases, and there's a feeblish handling of the panning effects. Even the music doesn't make much attempt to escape the frontal zone of the soundstage. Honestly, there's little to impress with this dull and rather sickly sound mix, but at least it isn't as bad as the video. 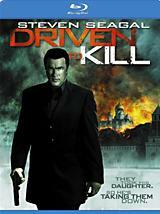 An atrocious movie with a mediocre audio package, no true supplements, and downright fugly video, 'Driven to Kill' is the poster child for "One to Avoid" Blu-ray titles everywhere. Trust me, there's a million other better ways to entertain yourself when you have a few hours to kill.